Yesterday was a big day at work. My department (the pharmacy) won the Halloween costume contest!!! 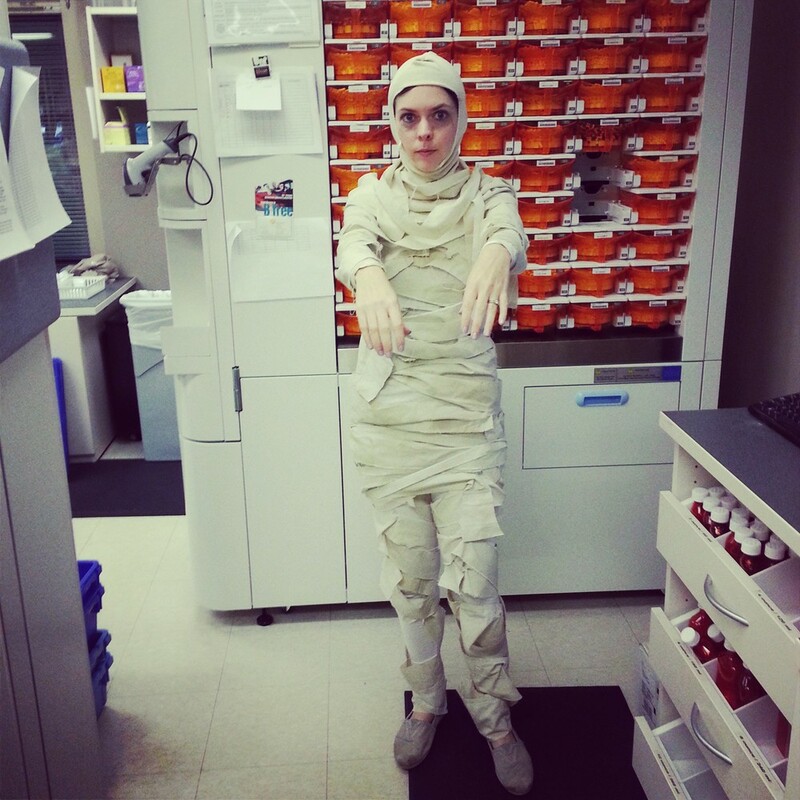 I was the mummy. I dyed a white sheet in some coffee. (I smelled like toffee coffee all day.) I ripped the sheets and pinned them to some long underwear. I used a spray sock on my head. I added a little black eye makeup and mummy done. I then realized that I needed gas in my car to get to work and I was dressed as a mummy. Nate went and got it for me after some mummy begging. Husbands. I had trouble looking at co-workers without laughing. Patients either stared or wouldn't look me in the eye as I explained their medications to them. You know, just another day at work. One of my co-workers had some cool embalming stuff and creepy Halloween decorations. Another co-workers brought in some dry ice and food coloring. Too much fun. More importantly, Ike dressed up too. He decided that he wanted to be Uncle Si from Duck Dynasty. Did you have a good Halloween? What was your favorite costume (either worn or seen)?